I love the hot, spicy taste of ginger. Even though the ginger here in Australia costs very expensive, nearly an arm and a leg, I still love using it generously in my cooking. Its health benefits are huge. It helps cure a variety of gut problems, like acid reflux. That said, it can kill cancer cells. My family and I enjoyed a dish mainly used ginger at a Japanese restaurant very much. It’s simple and delicious. I experimented and tried to replicate it at home the other day. My family was very satisfied with the outcome. If you have little kids at home, you might like to reduce the amount of ginger. 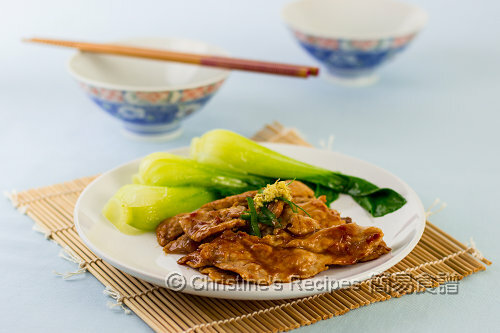 If you’re a spicy food lover, I strongly recommend this dish, ginger pork. 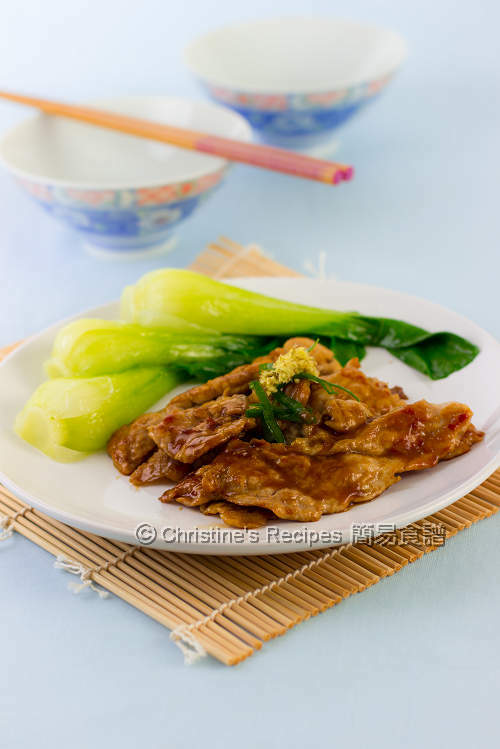 Generously garnish with more freshly grated ginger on top of the fried pork, that will entertain and make your taste buds dance. Mix all the ingredients of seasonings with grated ginger in a mixing bowl. Set aside. Rinse and cut the baby bok choy lengthways. Briefly cook them in salted boiling water until softened. Drain out and soak in cold water in order to help keep its green colour. Drain well again. Place on a serving plate. Slice the pork, each about 5mm in thickness. 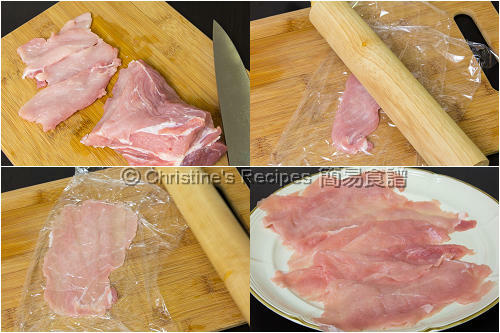 Wrap the slices in plastic wrap and tenderize by pounding flat with a rolling pin. Heat a little oil in a non-stick frying pan or a skillet over medium-high heat. Dip the pork slices into the seasonings. Quickly brown in the hot pan. You might like to proceed in batches. Immediately serve with the bok choy. Garnish with spring onion and freshly grated ginger. It goes really well with steamed rice. You can cook the remaining seasonings in a sauce pan and bring it to a boil. Drizzle over the cooked bok choy. It’s very delicious. As the pork is pounded to be very thin, it will absorb the seasonings and cooked through very quickly. Make sure not to over cook the pork, lest the pork turns tough. Mirin is a Japanese condiment, available at supermarkets or Asian grocers. Always love this to serve on top of a bowl of rice. The pork slices here are all nicely thinned, looks like they are 5mm than 5cm thick : ). Do you mean 5mm in thickness of the pork instead of 5cm? Oops, typo. Thanks for your question! Oh , didn't know ginger can cost so much there . In Singapore , young or old ginger is really cheap ! I could post u , if u want Christine ! Guess that I have to learn to grow ginger myself. The looks so yummy!!! Do you add any if the ginger to the seasoning, or while cooking? Or did you add it all fresh at the end? Thank yo for sharing! Use the 3 tsp of grated ginger to make the seasoning, and some extra for garnish at the end. Just to clarify. The 3 tsp of grated ginger is just for garnish ? You don't use any of that in the seasoning ? I am getting ready to try out this dish ! Perhaps add the ginger to the seasoning list, as I was also confused. I love the recipes, thanks for sharing!